Knowing that I had always wanted to fly on one of the blimps that you usually see hovering over sporting venues, my wife gave me for Christmas a two-hour flight aboard the zeppelin Eureka, the largest airship in the world, and one of only three zeppelins flying anywhere, the others being a sister ship in Friedrichshafen, Germany, where they were built by Zeppelin Luftschifftechnik, and one in Japan which does not carry passengers. 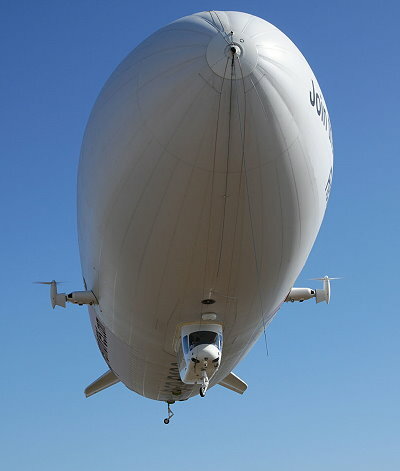 A zeppelin is differentiated from a blimp by having a rigid structure inside the gas envelope. 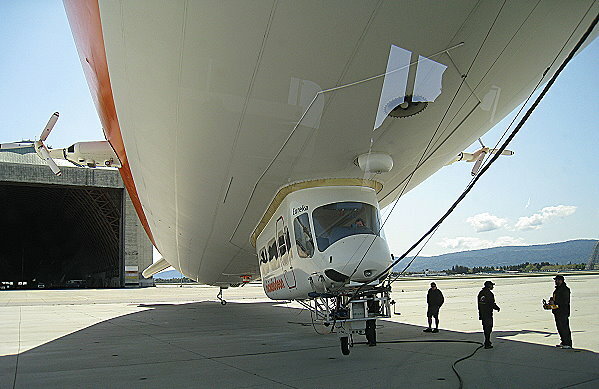 This rigid structure allows the airship to cruise more smoothly and also permits the anchoring of all main components such as the tail fins, passenger cabin and engines to this structure. Our flight ascended from the NASA/Ames facility's Moffett Field in Mountain View and cruised up the Bay northwards over Stanford University, Candlestick Park, San Francisco International Airport and then spectacularly over San Francisco itself, out over Alcatraz and along the Golden Gate Bridge, past Sausalito and Angel Island, returning over Oakland and the Coliseum, Alameda and Oakland International, and then back down the Bay to Moffett Field. Eureka is filled with helium maintained at at least 96% purity, and the envelope volume is almost 300,000 ft3 . The maximum take-off weight is 17,725 lbs and her effective range is approximately 560 miles. Her fuel consumption rate is 50 kg/hr so she is a very efficient craft. Eureka carries various different kinds of advertising logos at various times. At the time we flew on her, she was still displaying the Nickelodeon Kid's Choice Awards logo. Once she was decorated with advertising for the Disney/Pixar film UP. Eureka completed construction in 2008 and was brought fully built across the Atlantic on the deck of a container ship, arriving in Beaumont, Texas, from where she flew to the Bay area. She has been conducting passenger flights since October, 2008. She is owned by Airship Ventures, and flies up and down the California coastline, offering passenger flights out of Long Beach and San Diego in addition to the San Francisco area. 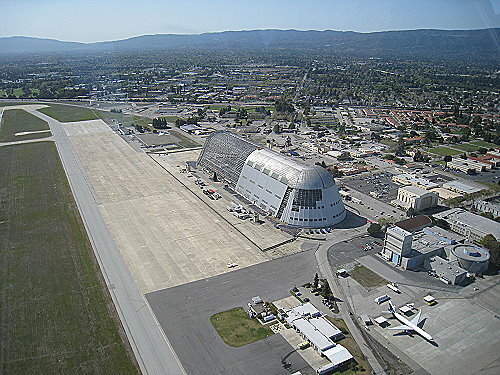 In Mountain View she is berthed at historic Hangar Two at Moffett Field, named for Rear Admiral William A. Moffett, an advocate of the development of lighter-than-air dirigibles, who with 72 others was killed when the USS Akron, which was then the largest dirigible in the world, went down in a storm off the coast of New Jersey on April 4, 1933. Hangar Two is one of the largest free-standing wooden structures in the world. Taking off from Moffett Field, we fly over Hangar One, shown above and below, the hangar built in the 1930's for the U.S. Navy's 784-foot long airship Macon, which was lost in a storm off of Big Sur in 1935. 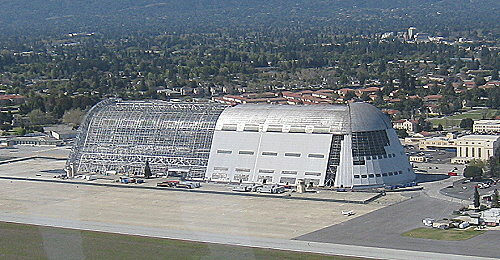 The hangar is currently having its exterior shell removed and replaced due to asbestos contamination. By comparison, the Eureka is 246 feet long, 15 feet longer than a Boeing 747. Her typical cruising speed and altitude are 35-40 mph and 1000 feet. She has four propellers, one on each side above the passenger cabin, and two at the tail. Three of these propellers can rotate 120° to provide various hover and thrust capabilities. 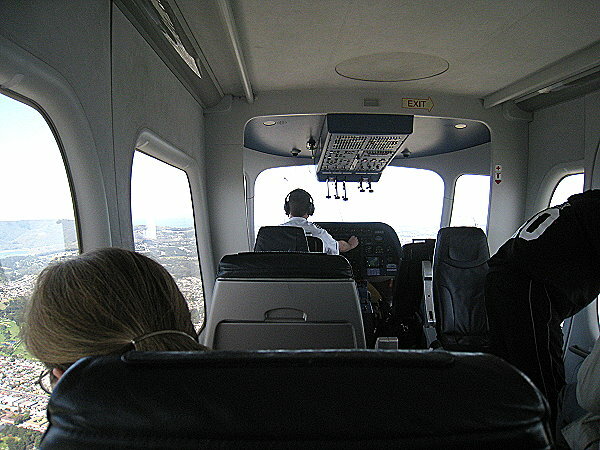 The interior of the passenger cabin is surrounded by large windows that provide unobstructed views in all directions, and there are two small windows that passengers can stick their heads out through, earning them the appellation of 'Zep-head.' Eureka can carry two crew including the pilot and up to twelve passengers. 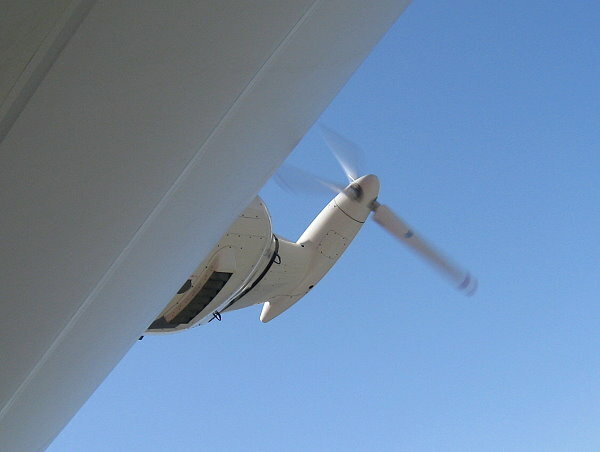 Below: one of the lateral engine/propellor components. Since Eureka presents such a large surface area to any prevailing winds, she is strictly limited to flying in conditions of 10-15 knots or less. 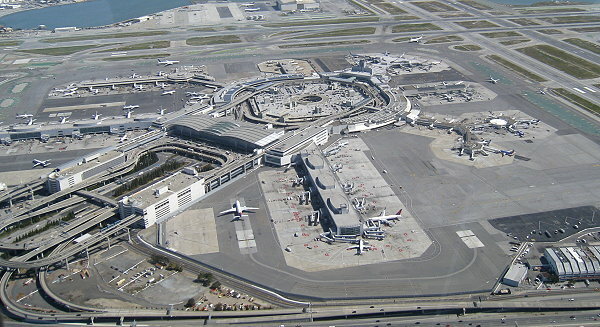 The takeoff and landing would be the most problematic times when winds are gusting more than that. She is housed in a hangar at night unless windspeeds exceed 7 knots, in which case she remains outside and anchored to a 32-ton mast truck. Although her cruising altitude is about 1000', she is capable of ascending to a maximum of about 9000'. Last year she flew back east and visited over 30 cities, offering flights and participating in airshows. 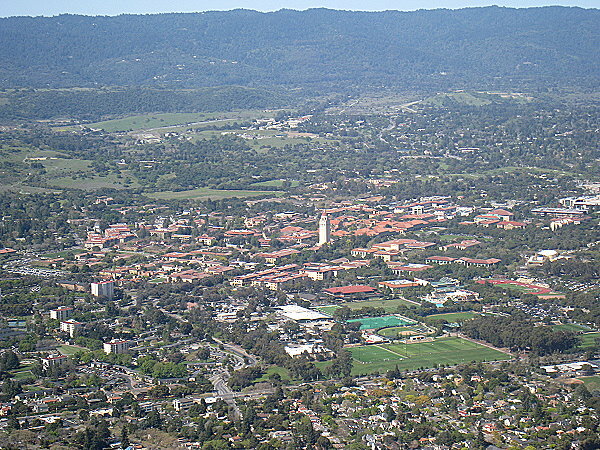 Above: Stanford University. 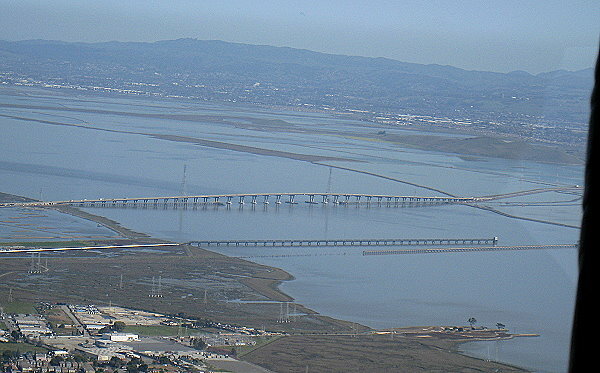 Below: San Mateo Bridge. The gas which fills Eureka's envelope, helium, although the second most abundant element in the observable universe, is relatively rare on Earth. It is produced by the radioactive decay of heavy radioactive elements like thorium and uranium. Commercial helium is produced by extraction from natural gas. When the first American dirigible, the USS Shenandoah, was built in the 1920's, it was the first to use helium and contained most of the world's supply at that time. By the time the Hindenburg was built, the flammability of hydrogen was well-known and although its designers wanted to use helium, they were not able to secure sufficient quantities because the United States controlled almost all the helium that was then available. 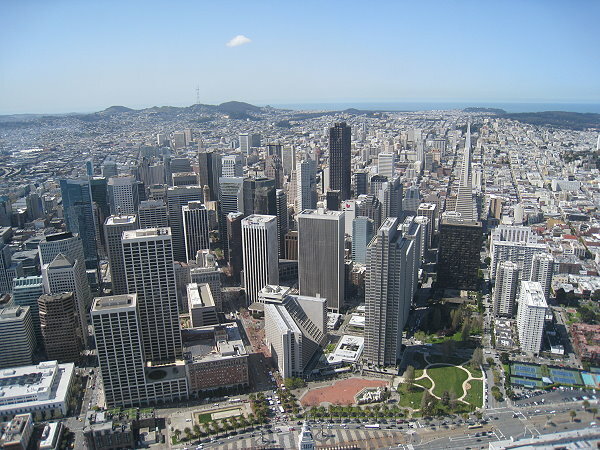 Top: San Mateo neighborhood. Middle: 101 Freeway. Bottom: Crystal Springs Reservoir. 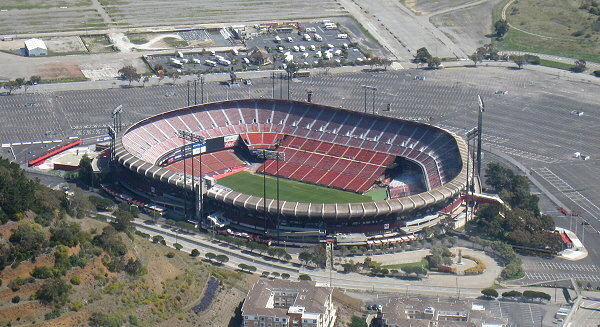 The Cow Palace in Daly City, famous sports arena and home to such teams as the San Francisco Warriors, San Jose Sharks and soon the San Francisco Bulls. The 1956 and 1964 Republican Conventions were held there and the Beatles opened their first North American concert tour there. The Cow Palace is also home to the annual Grand National Rodeo. 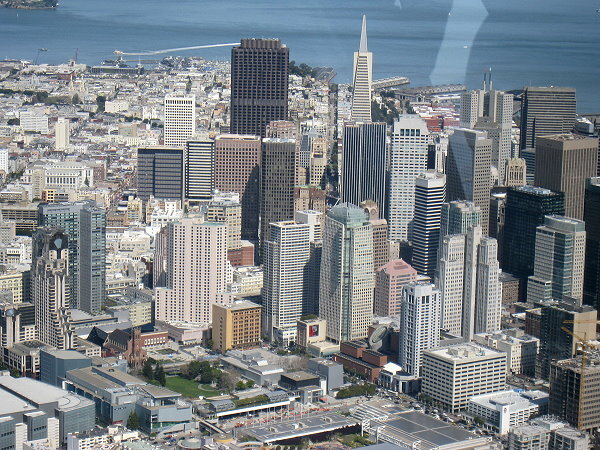 Above: Eureka's shadow crosses the Bay Bridge. Below: Coit Tower on Telegraph Hill. Zeppelins were originally conceived of and designed by the German Count Ferdinand von Zeppelin and the first zeppelin flight took place in 1900. What most people think of when they think of zeppelins is the era of transatlantic flight when the German zeppelins Graf Zeppelin (LZ-127) and Hindenburg (LZ-129) carried thousands of passengers. Earlier the zeppelin designated as LZ-126 was given to the United States by Germany as part of reparations for WWI and was purchased by the U.S. Navy and renamed USS Los Angeles. The Graf Zeppelin had an impressive record, flying almost a million miles and completing the first circumnavigation of the globe by air. 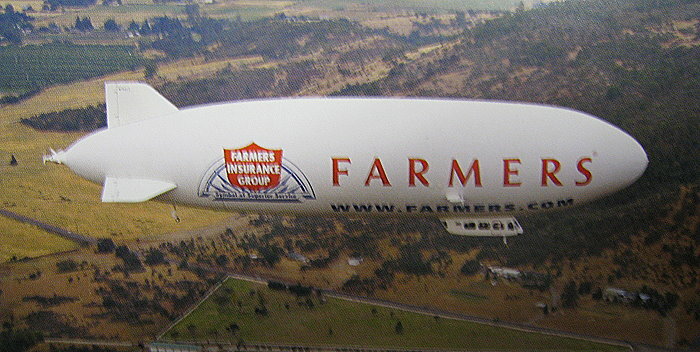 The 1937 loss of the Hindenburg, the largest airship ever to fly, and 35 of the 97 aboard in Lakehurst, New Jersey, signalled the end of commercial dirigible travel in the United States and effectively everywhere else, but now seventy-five years later, thanks to Airship Ventures, we can once again enjoy safe and comfortable cruising and unparalleled views of the areas over which Eureka flies.